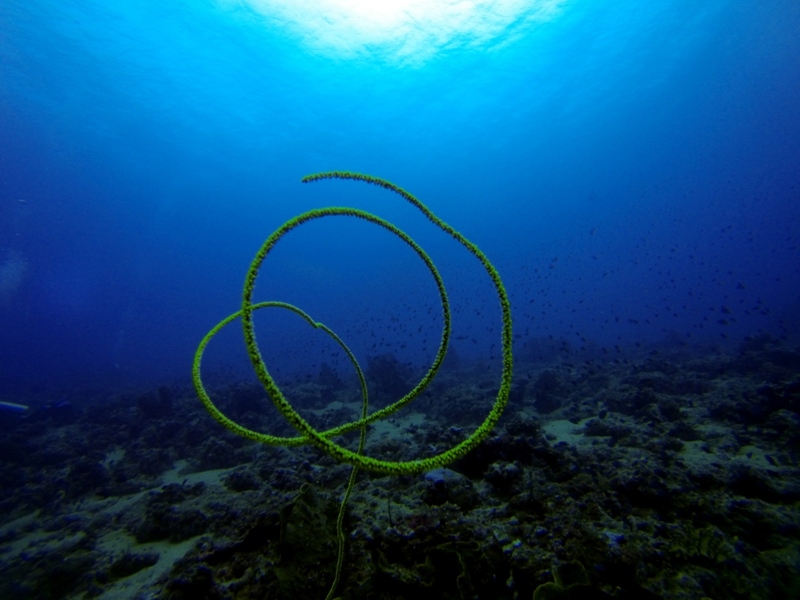 I’ve just returned from an excellent diving holiday around Raja Ampat in Indonesia on board the SY Indo Siren. The Indo Siren is a beautiful wooden boat. Her creaking timbers and gentle rolling were pretty effective as a sedative after three or four dives and a Bintang or two. The holiday actually began in Perth, meeting up with my partner who was staying with her friends there. We had a lovely time coffee tasting (the wine tasting had been taken care of by my partner and friends the previous day), dining and learning to play 500. We also met up with one of my friends who took us to Freemantle for lunch. From Perth we flew to Denpasar. We spent the morning doing the obligatory bargaining and shopping in Kuta. The highlight for me, was finding a lady with a tiny store down one of the many back streets selling fresh fruit. We were introduced to Salac or snake skin fruit. The skin is very much like snake skin, but once peeled away, the fruit resembles garlic. The taste is hard to describe, but dry and sweet. not like garlic at all. I must admit, Kuta was not my cup of tea, and I don’t think that it’s a good representation of Bali. But more about Bali later. In the evening we met up with the rest of the dive group, including my sister, who we were to spend the next 14 days. 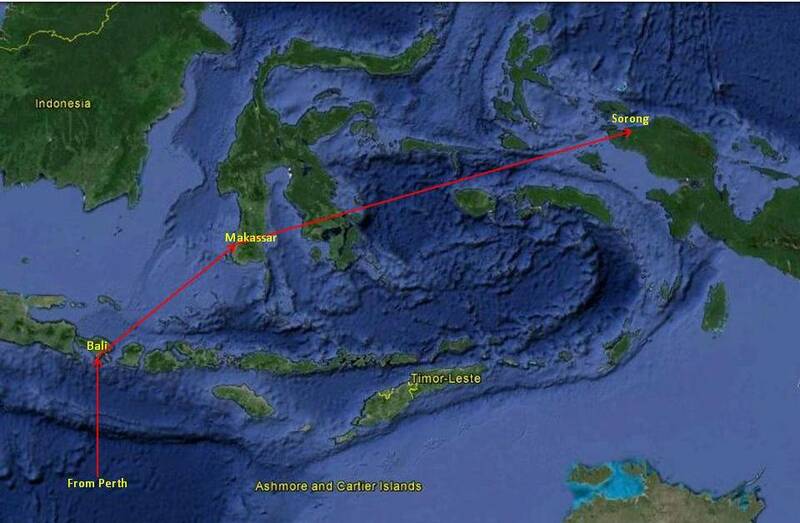 The following morning we all departed Denpasar and flew to Makassar, the main city on Sulawesi where we spent the night. Unfortunately, we didn’t get much of a chance to look around Makassar or Sulawesi, and again, I don’t think that our hotel was much of an indication of the rest of the city. From Makassar we flew to Sorong, on Western Papua, where we finally met our tour director, Jan (that’s the Dutch name, pronounced Yaan). We boarded the SY Indo Siren at the harbour and set sail (or motored, if you want the boring true story) that evening for Waigeo where we started our diving. We spent the next ten days cruising around the islands of Raja Ampat, diving three or four times each day. 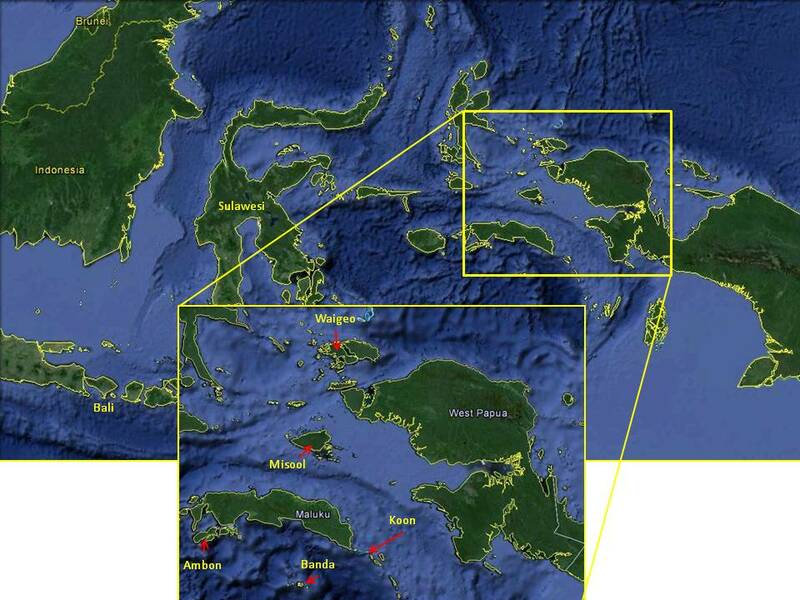 From Waigeo we sailed (motored) south to Misool, then rounded the cape at Koon, down to Banda and then north west to Ambon. The water was a balmy 28 degrees and that spectacular clear blue colour. 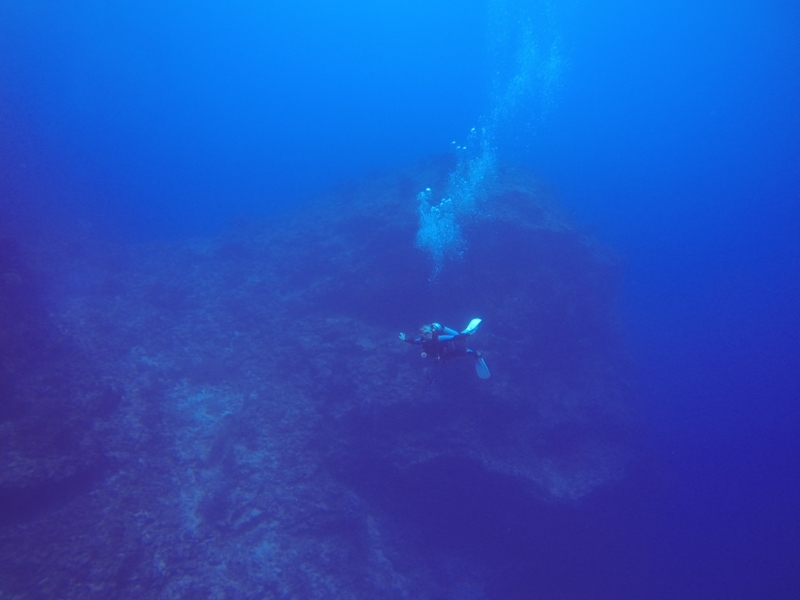 We did a lot of wall diving and current diving and even a couple of exploratory dives. The diving stand outs for me were seeing the pygmy seahorses and the ghost pipefish, an animal that I’ve been trying to find for over a decade! 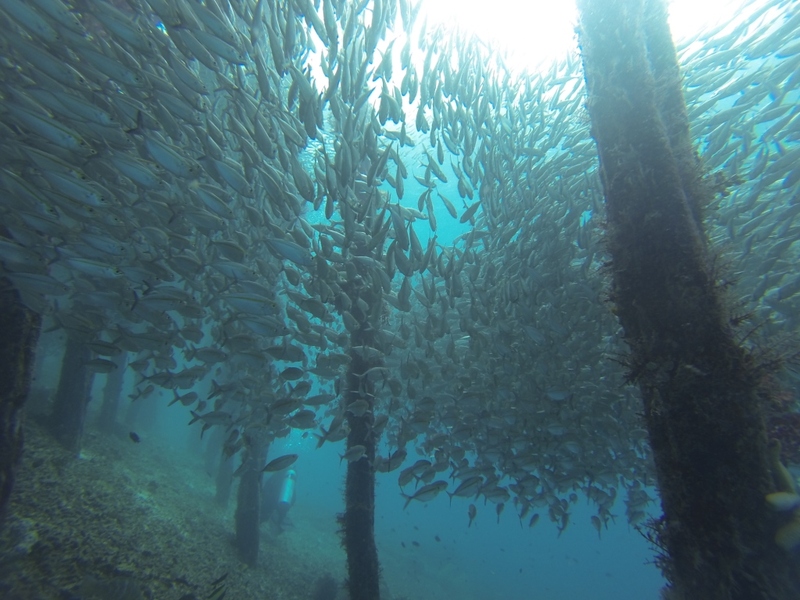 We also did one dive at Batu Kapal, or Ship Rock, where the visability must have been approaching 50 m! 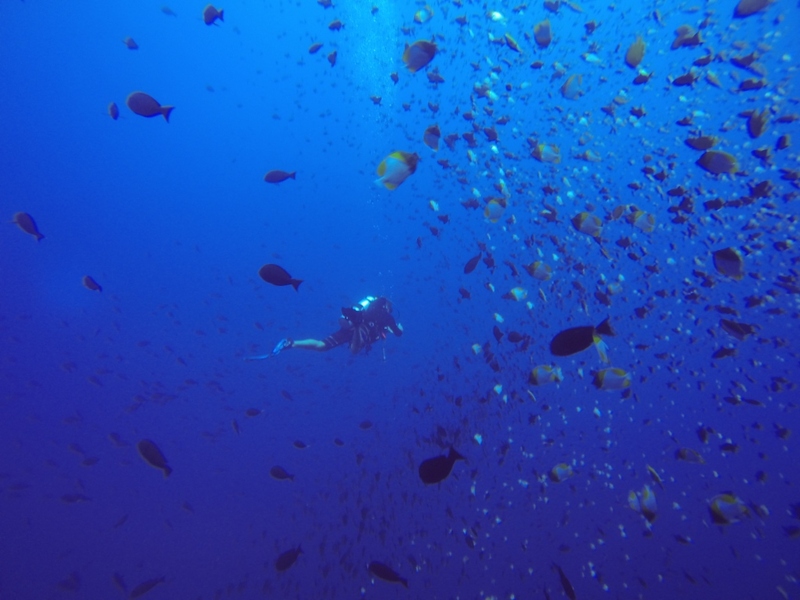 Most of the reefs were carpeted in very healthy coral and sponge communities, and there were massive schools of red-tooth trigger fish fluttering above the many of the dive sites. We often caught sight of schools of jacks and trevally harassing schools of baitfish and the odd dog-tooth tuna or rainbow runner or barracuda coming in for a look. 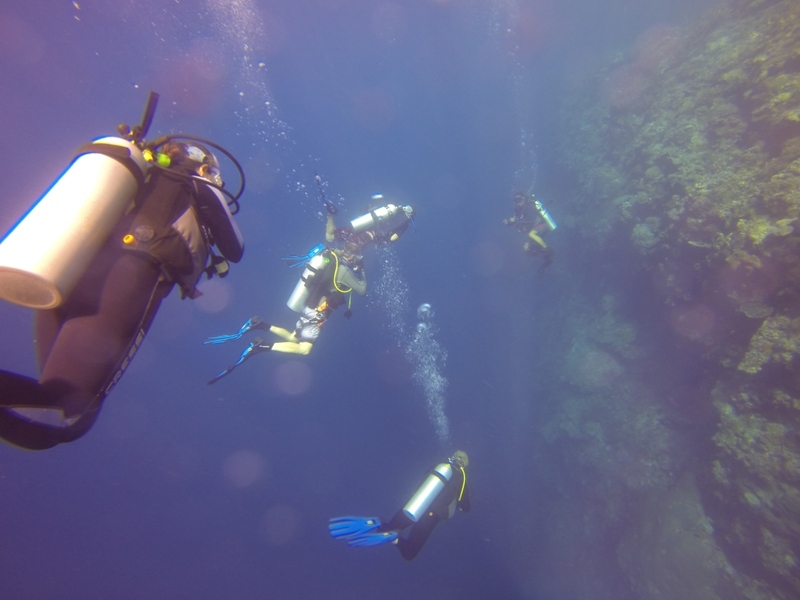 It is too difficult to describe all of the diving we did here and photos never do it justice, but I’ve tried to give a glimpse in the photos at the end. Above the water, we made landfall in Arborek village, in Waigeo, where we went for a walk through the village and along the shoreline. In Misool, we went for a ride in the dinghy through the spectacular islands of Farondi and swam in a beautiful lagoon surrounded by steep jungled peaks. We did a historic tour in Banda where we saw the old Dutch forts and a nutmeg farm where we were treated to breakfast made from the fresh farm produce. 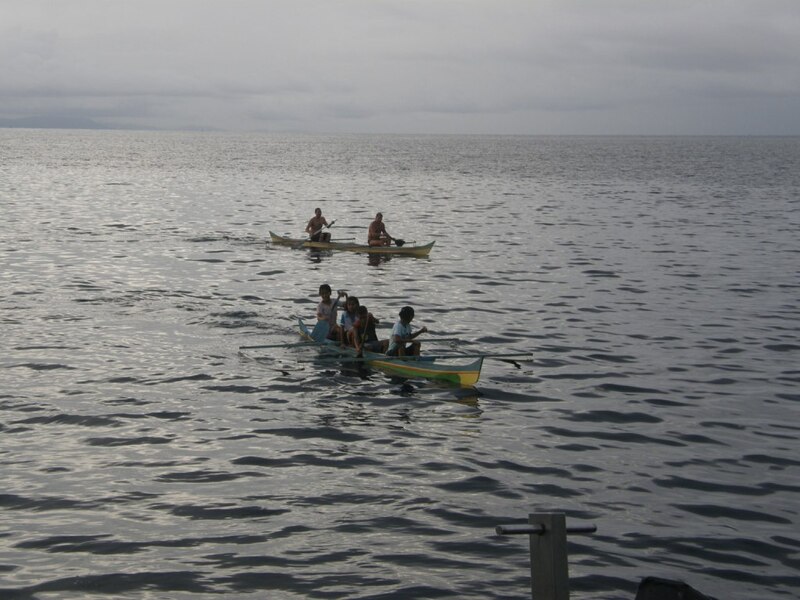 In Nusa Laut, we delayed the diving program for a canoe race with the local children from Akoon village. Rich (one of characters in our dive group) and I managed to almost capsize our kayak, which happened to belong to the village chief and had his keys and cigarettes in it! but we bailed out just in time to stop the kayak from overturning. Phew! We finished up our diving trip in Ambon, where we said our farewells to the crew, who had shown us an excellent time. A special thanks to our dinghy driver, Fendi and our chef, Ishmael, who put in the extra effort to get to know us a bit more. You guys made our trip that much more memorable. A big thanks to all of the crew for keeping the boat running, the dive deck functioning and the beautiful warm towels and refreshing drinks after the dives! I’d also like to thank Bill and Julia of Dive Jervis Bay for keeping the trip running smoothly and getting the whole group through the many airport transfers. You guys made it look easy! 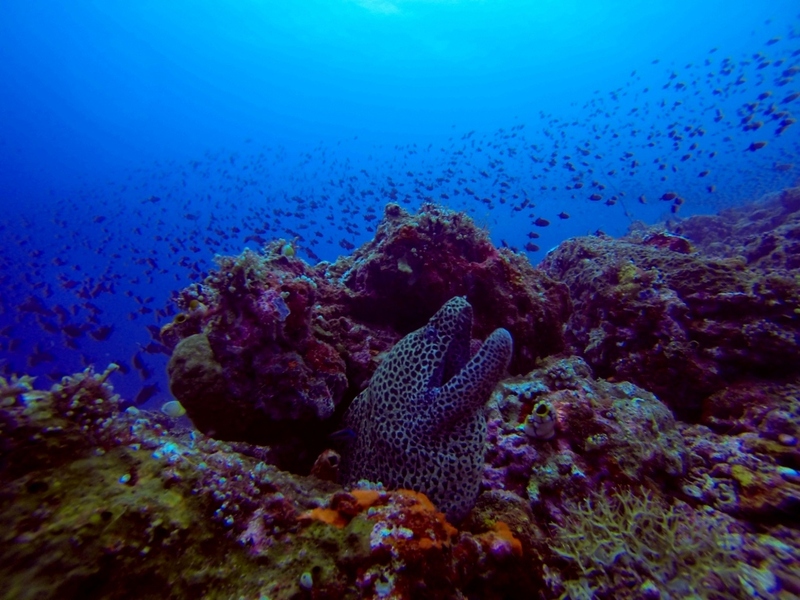 At the conclusion of our diving trip, my partner and I decided to spend a couple of days on the north coast of Bali in a beautiful little fishing village called Tejukula. The three hour drive to the north took us through Ubud. The stone carvings and wood works of Ubud soon gave way to rice padis and thick groves of tropical jungle as the road began to wind up into the mountains. At the top of the range, we took a break to admire Bali’s highest peak, Kintamani. Then it was all down hill (literally speaking, not figuratively) to the black sand coast line of Bali’s north shore. We stayed at Cili Emas, a nice secluded retreat right on the beach. Cili Emas was a beautiful relaxed resort, with only six villas. The German owners, Nicole and Yohan, made us feel very welcome and the staff were lovely. We especially enjoyed having a chat with Komung who made us feel right at home. We took a day tour around the local area with our driver, Kuday, who gave us a much better insight into Balinese culture, than what Kuta gave us. We visited several temples and drove up into the mountains to Gitgit waterfall. We explored the local market in Singaraja and the botanic gardens in Bedugul. We visited the Banjar hot springs and the twin lakes. My favourite parts of the tour were the local markets and also stopping for coffee at Kubu Kopi plantation on the narrow mountain road where we tried some spiced coffee and cacao coffee with local treats. On our last day in Bali we had planned to hire scooters and explore the local area. But unfortunately, my partner succumbed to a bout of Bali belly. Not wanting to slow the team down though, my partner instructed me to get out and about and report back on what the area had to offer. So off I went on my scooter. I decided to head up to a nearby waterfall. I rode my scooter as far up the path to the fall as I dared and then walked the last couple of kilometres up the narrow windy dirt track. Several times I had to jump into the bush to let the local kids past on their scooters! The walk up to the waterfall was beautiful, but I was a little saddened to be walking along a path with a flowing aqueduct on my left and a bone dry creek bed to my right. At the fall, the natural flow of water had been completely diverted into the aqueduct. Despite this the waterfall was beautiful and the water was very refreshing after walking through the 30 degree heat. After checking in on my partner I decided to head in the opposite direction. I took a small road leading up into the mountains. By this stage my faithful steed was in need of a drink, so I pulled into a local store selling petrol in vodka bottles. The store owner’s son, Pande, was sitting outside with some friends playing a guitar. I pointed to the guitar and asked what they were playing. In response I was given a big smile and asked “you play”? I ended up sitting and playing a few songs with them. Though our spoken conversation wasn’t very successful (despite their decent English speaking ability and my terrible Indonesian) it was one of the most memorable events of the trip. The international language of music and a good laugh is just as good as any spoken communication in my book. After leaving Pande and his friends to their guitaring I continued along the mountain road. It was a very scenic drive, winding along the narrow road surrounded by lush jungle and steep terrain. Riding through several small villages was fun, smiling and waving at the kids, dodging chickens and trucks and being chased by dogs. After climbing the mountain for about half an hour, I still wasn’t even close to the top, so I decided to head back down. That afternoon, it was time for us to leave Cili Emas. We wound our way back up the mountain pass and down through Ubud and back into the hustle and bustle of Denpasar. We had a fantastic few weeks in Indonesia. I feel like we’ve only just scratched the surface of this little corner of the world. I can’t wait to head back to see what else there is to discover. Brilliant, Marty, thanks for sharing!! Awesome photos! I tried to pick a favourite. But I can’t. Schmacko! You’ve summed it up exceptionally well. LOVE the morey pic!! Enter your email address to follow Squiddled Thoughts and receive notifications of new posts by email.